It is a paradox of sorts that although India is one of the fastest growing economies, millions of its citizens reel under extreme poverty. According to Suresh Tendulkar Committee report, 37.2 percent of Indians qualify as poor. The recent National Sample Survey shows that about five percent of the total population in the country sleeps without having two square meals a day. Right to food is a basic human right and reduction of poverty and hunger is the foremost goal of the Eighth United Nations Millennium Development Goals. Government of India has drafted the National Food Security Bill that promises 25 kg of food grain per month at Rs 3 per kg to each family, Below Poverty Line (BPL). Public Distribution Systems (PDS) is India’s largest social assistance program, which has the objective of maintaining stability of food grain prices by way of establishing minimum procurement prices and providing subsidised basic food, sugar and cooking fuel to the less privileged. It has its origin to the famines and the food shortages of the 1960s. 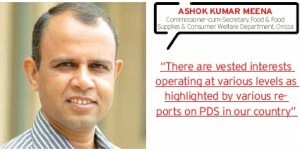 Till 1992, the PDS was universal in India, available to all consumers. In 1992, Government of India introduced Revamped PDS (RPDS) in limited areas, primarily drought prone, tribal, hilly and remote. It was later substituted by Targeted PDS (TPDS) in 1997. TPDS is specifically aimed at BPL families in all parts of the country, under which each poor family was entitled to 10 kg of food grain per month at a subsidised price. The allocation was increased to 20 kg with effect from April 2000, and to 25 kg per family from July 2001 onwards. It was further increased to 35 kg in 2003-04. In order to make TPDS more focused towards the poorest of the poor, the “Antyodaya Anna Yojana” (AAY) was launched in December 2000. AAY aims at providing this target group food grains at a highly subsidised rate—wheat at Rs 2 per kg and rice at Rs 3 per kg. Under PDS, presently the commodities namely wheat, rice, sugar and kerosene are being allocated to the states and UTs for distribution. Some states also distribute additional items of mass consumption through the PDS outlets such as cloth, exercise books, pulses, salt and tea. PDS is being implemented by the Department of Food and Public Distribution, Ministry of Consumer Affairs, Food and Civil Supplies, Government of India, and covers over 65 million poor families in the country. With a network of about 5.01 lakh Fair Price Shops (FPSs) as per the ministry’s figures, PDS may well be the largest public food distribution network across the globe. There are six key functional areas covering all processes under TPDS, which include allocation and utilisation reporting, storage, movement, finance, licensing and regulation and grievance redressal. PDS is being operated under the joint responsibility of the central and state governments, with the former responsible for procurement, storage, transportation (up to the district headquarters) and bulk allocation of food grains. 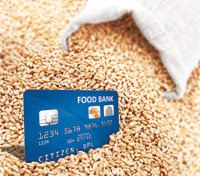 The state governments are responsible for distributing these food grains to citizens through a network of FPSs. This responsibility includes identification of BPL families, issuing of BPL cards, and supervision and monitoring of the functioning of the FPSs. States are also responsible for movement of food grains from the district headquarters to the FPS. of India. Talking about the issue of bogus and duplicate cards, Vilas Kanyal, Head for India and Asia-Pacific Business, Mastek, says, “It is a vicious cycle with the state and centre having to procure additional amounts of grain for ineligible, duplicate and bogus ration cards, with the additional grain eventually ending up in the open market. The most serious flaw in the whole PDS is the lack of transparency and accountability in its functioning. The system lacks transparency and accountability at all levels, which makes monitoring of the system extremely difficult. Transportation of food grains and appointment of dealers of FSPs are also difficult issues. In spite of the presence of entities like the Vigilance Committee and Anti-Hoarding Cells constituted to ensure smooth functioning of the PDS, their impact is virtually non-existent at the ground level, leaving mal practices in the system to thrive. To address the problems inherent in public distribution of food supplies, the country’s Department of Food and Public Distribution in the Ministry of Consumer Affairs, Food and Civil Supplies, has been taking various initiatives and also advising states and UTs on a continuous basis on ensuring proper identification of beneficiaries, achieving timely delivery of food grains and adoption of innovative ways of distribution involving community participation. Aspects like enhancing viability of FPSs, construction of additional and decentralised storage facilities, and monitoring of distribution of PDS items through social audit by local bodies or NGOs are also being looked into. ICT is being utilised in TPDS by the centre as well as state governments and UTs. At a conference of state and UT food secretaries on ‘best practices and reforms in targeted public distribution system’ held in July 2010 at New Delhi, it was resolved that rapid but phased rollout of IT in PDS must be given priority. Department of Food and Public Distribution has taken several initiatives for computerisation of TPDS. A pilot scheme on computerisation of TPDS has been approved in August 2009 with an outlay of Rs 53.47 crore. It involves computerisation of processes related to allocation of food grains to states, off take, storage, movement, finance, licensing and regulation, grievance redressal and reporting. In the first phase, the scheme has been approved to be implemented in three districts each of the four pilot states—Andhra Pradesh, Assam, Chhattisgarh and Delhi. Also, there will be piloting of food grain bag tracking in one district in Chhattisgarh. 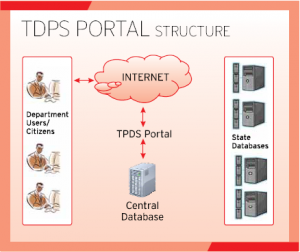 The proposed IT system for computerisation of TPDS is envisioned to be achieved by developing a TPDS portal, with the necessary automated workflow in the background to act as a single point of reference for all key functional areas to citizens and department users based on user roles and privileges. 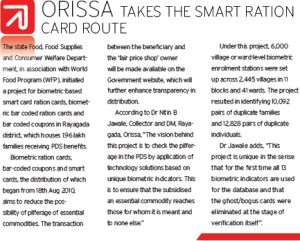 Prior to this, a pilot scheme on smart cardbased delivery of TPDS commodities was approved for the Chandigarh UT and Haryana in December 2008 with an outlay of Rs 142.29 crore. The scheme aims to assist in proper identification of beneficiaries and ensure that TPDS commodities are received only by the targeted persons. The smart cards will contain biometric features of adult members of the ration card holder families. The smart cards as well as smart card transaction terminals will also store details of transactions of TPDS commodities issued. Both Chandigarh UT Administration and Government of Haryana have completed trial runs of smart card-based transaction of TPDS commodities on June 7 and June 17, respectively. The project has been launched on July 13, 2010. Replicating these schemes in other states and UTs will be considered after the schemes are evaluated on fulfilment of objectives and suitability of technology. While central government has been driving the initiative to cleanse the PDS system a lot of ground has been covered by some of the states towards digitisation of ration cards, procurement of food grains, allocations to fair price shops, issue of smart card based ration cards, and grievance redressal. Besides, some of the state governments like Chhattisgarh are also using GPS for tracking and monitoring of the entire PDS supply and distribution chain. Chhattisgarh: In its bid to streamline the PDS system in the state, particularly to ensure that the benefits of Chief Minister’s special Rs 2 per kilogram rice scheme reaches out to the BPL population, the state Food and Civil Supplies department has created a central ration cards database, which is online for everybody to see. The state has also completed the process of automating the entire food grain supply chain—from paddy procurement, its storage, milling and distribution of rice and other commodities to 3.7 million ration card holders through 10,416 FPS. With the database of beneficiaries and the FPS in place, the state government is now not only able to monitor the inventory and accounts of State Civil Supplies Corporation, it can also keep track of record of lifting, sales of ration commodities and issue of ration commodities from warehouses to fair price shops. The project also has a component of public interface, complete with a call center for public grievances. The state plans to install Global Positioning System (GPS) devices to track the movement of vehicles carrying subsidised rice for the poor to ensure effective implementation of PDS food grains. The GPS devices will give complete information on where and for how long the vehicles carrying rice halted after loading at the warehouses and before unloading the rice at PDS shops. Tamil Nadu: This is one state that is way ahead of others in using technology to prevent diversion and malpractices in PDS. The state government initiative includes an e-Services project that has been rolled out for updating the online ration card database and carry out corrections and modifications that have taken place over the last 4-5 years. In fact, the corrections that are carried out at taluk level and the corrected data are expected to be posted in TNSWAN online. This ensures that the card database is dynamic and the latest information is available on real time basis. The state government is looking at using the data and the system for automating the shop wise monthly allocation generation process. The Government also intends to use this updated database for taking up 100 percent door-todoor verification of the ration cards to eliminate bogus cards in a phased manner. To check diversion of PDS commodities, control rooms have been opened in all districts, including in Chennai. As a trial measure, a GPS-based vehicle movement monitoring system has been implemented in Thiruvallur and Krishnagiri districts to track the movement of vehicles carrying PDS goods. Similarly the state government has also introduced an online warehousing monitoring system for enabling online capture of all transactions in a phased manner. To prevent mass diversion of goods by lorry drivers, every vehicle is accompanied by a department assistant who is provided with a special SIM card that helps in tracking the movement of the vehicle. Further, SMS-based fair price shop stock monitoring has been set up by the Cooperative Department to track the stock of every commodity at each fair price shop on a daily basis. Handheld billing machines with GPRS connection have been installed in all fair price shops in Chennai to enable real time monitoring of sales and stocks. Maharashtra: The Public Distribution Department of Maharashtra Government plans to provide smart cards with biometric information to 2.24 crore card holders in the coming year. The state government is also computerising the entire ration distribution system and planning to adopt newer echnologies to stop pilferage in the system. 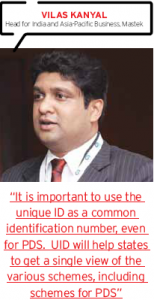 The Unique Identification (UID) or the Aadhar program can share the burden of PDS reform by assisting in positive identification of unique individuals and families. This can lead to a high-quality beneficiary database without duplicate and ghost cards, thus improving the targeting of benefits. In this context, a task force headed by Director General, National Informatics Centre and comprising representatives from Department of Information Technology, UIDAI, Department of Food and Public Distribution, FCI and the selected states and UTs has been entrusted with the responsibility of working out the modalities for integration of existing projects and also to suggest how the unique identity number will eventually be leveraged for TPDS purposes. PDS can benefit from the legislative, technology and administrative infrastructure being created for the implementation of the UID programme. Integration with the UID program will lead to better identification of individuals and families. This will lead to better targeting and increased transparency and therefore better functioning of the system and its public approval. UID numbers generated. These food coupons will capture all biometric, tax, demographic and personal information, enabling authorities to ensure proper distribution of food rationing and other benefits. HCL Infosystems has bagged this order, which will involve setting up an efficient model of food and civil supplies distribution in the state based on UIDAI guidelines, for over 10 million expected transactions per month. While technology is not a panacea, it can still be a powerful tool in improving the effectiveness of PDS. It can help bring in the much needed transparency in the system. It can drive consistent efforts to streamline efficiencies at administrative and monitoring levels so that any vested interests can be countered effectively.